The field of water resources management will have to continue to adapt to the current and future issues facing the allocation of water. With the growing uncertainties of global climate change and the long term impacts of management actions,the decision-making will be even more difficult. It is likely that ongoing climate change will lead to situations that have not been encountered. As a result, alternative management strategies are sought for in order to avoid setbacks in the allocation of water resources. Ideally, water resource management planning has regard to all the competing demands for water and seeks to allocate water on an equitable basis to satisfy all uses and demands. As with other resource management, this is rarely possible in practice. One of the biggest concerns for our water-based resources in the future is the sustainability of the current and even future water resource allocation. As water becomes more scarce, the importance of how it is managed grows vastly. Finding a balance between what is needed by humans and what is needed in the environment is an important step in the sustainability of water resources. Attempts to create sustainable freshwater systems have been seen on a national level in countries such as Australia, and such commitment to the environment could set a model for the rest of the world. Visualisation of the distribution (by volume) of water on Earth. 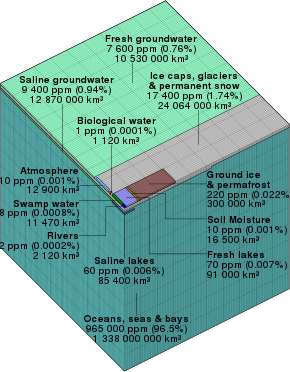 Each tiny cube (such as the one representing biological water) corresponds to approximately 1,000 cubic kilometres (240 cu mi) of water, with a mass of approximately 1 trillion tonnes (2000 times that of the Great Pyramid of Giza or 5 times that of Lake Kariba, arguably the heaviest man-made object). The entire block comprises 1 million tiny cubes. Water is an essential resource for all life on the planet. Of the water resources on Earth only three percent of it is fresh and two-thirds of the freshwater is locked up in ice caps and glaciers. Of the remaining one percent, a fifth is in remote, inaccessible areas and much seasonal rainfall in monsoonal deluges and floods cannot easily be used. As time advances, water is becoming scarcer and having access to clean, safe, drinking water is limited among countries. At present only about 0.08 percent of all the world’s fresh water is exploited by mankind in ever increasing demand for sanitation, drinking, manufacturing, leisure and agriculture. Due to the small percentage of water remaining, optimizing the fresh water we have left from natural resources has been a continuous difficulty in several locations worldwide. Much effort in water resource management is directed at optimizing the use of water and in minimizing the environmental impact of water use on the natural environment. The observation of water as an integral part of the ecosystem is based on integrated water resource management, where the quantity and quality of the ecosystem help to determine the nature of the natural resources. As a limited resource, water supply sometimes supposes a challenge. This fact is assumed by the project DESAFIO (the acronym for Democratisation of Water and Sanitation Governance by Means of Socio-Technical Innovations), which has been developed along 30 months and funded by the European Union’s Seventh Framework Programme for research, technological development and demonstration. This project faced a difficult task for developing areas: eliminating structural social inequity in the access to indispensable water and public health services. The DESAFIO engineers worked on a water treatment system run with solar power and filters which provides safe water to a very poor community in the state of Minas Gerais. For water as a resource, this is particularly difficult since sources of water can cross many national boundaries and the uses of water include many that are difficult to assign financial value to and may also be difficult to manage in conventional terms. Examples include rare species or ecosystems or the very long term value of ancient groundwater reserves. Agriculture is the largest user of the world's freshwater resources, consuming 70 percent. As the world population rises it consumes more food (currently exceeding 6%, it is expected to reach 9% by 2050), the industries and urban developments expand, and the emerging biofuel crops trade also demands a share of freshwater resources, water scarcity is becoming an important issue. An assessment of water resource management in agriculture was conducted in 2007 by the International Water Management Institute in Sri Lanka to see if the world had sufficient water to provide food for its growing population or not . It assessed the current availability of water for agriculture on a global scale and mapped out locations suffering from water scarcity. It found that a fifth of the world's people, more than 1.2 billion, live in areas of physical water scarcity, where there is not enough water to meet all their demands. A further 1.6 billion people live in areas experiencing economic water scarcity, where the lack of investment in water or insufficient human capacity make it impossible for authorities to satisfy the demand for water. The report found that it would be possible to produce the food required in future, but that continuation of today's food production and environmental trends would lead to crises in many parts of the world. Regarding food production, the World Bank targets agricultural food production and water resource management as an increasingly global issue that is fostering an important and growing debate. The authors of the book Out of Water: From abundance to Scarcity and How to Solve the World's Water Problems, which laid down a six-point plan for solving the world's water problems. These are: 1) Improve data related to water; 2) Treasure the environment; 3) Reform water governance; 4) Revitalize agricultural water use; 5) Manage urban and industrial demand; and 6) Empower the poor and women in water resource management. To avoid a global water crisis, farmers will have to strive to increase productivity to meet growing demands for food, while industry and cities find ways to use water more efficiently. As the carrying capacity of the Earth increases greatly due to technological advances, urbanization in modern times occurs because of economic opportunity. This rapid urbanization happens worldwide but mostly in new rising economies and developing countries. Cities in Africa and Asia are growing fastest with 28 out of 39 megacities (a city or urban area with more than 10 million inhabitants) worldwide in these developing nations. The number of megacities will continue to rise reaching approximately 50 in 2025. With developing economies water scarcity is a very common and very prevalent issue. Global freshwater resources dwindle in the eastern hemisphere either than at the poles, and with the majority of urban development millions live with insufficient fresh water. This is caused by polluted freshwater resources, overexploited groundwater resources, insufficient harvesting capacities in the surrounding rural areas, poorly constructed and maintained water supply systems, high amount of informal water use and insufficient technical and water management capacities. In the areas surrounding urban centres, agriculture must compete with industry and municipal users for safe water supplies, while traditional water sources are becoming polluted with urban runoff. As cities offer the best opportunities for selling produce, farmers often have no alternative to using polluted water to irrigate their crops. Depending on how developed a city’s wastewater treatment is, there can be significant health hazards related to the use of this water. Wastewater from cities can contain a mixture of pollutants. There is usually wastewater from kitchens and toilets along with rainwater runoff. This means that the water usually contains excessive levels of nutrients and salts, as well as a wide range of pathogens. Heavy metals may also be present, along with traces of antibiotics and endocrine disruptors, such as oestrogens. Developing world countries tend to have the lowest levels of wastewater treatment. Often, the water that farmers use for irrigating crops is contaminated with pathogens from sewage. The pathogens of most concern are bacteria, viruses and parasitic worms, which directly affect farmers’ health and indirectly affect consumers if they eat the contaminated crops. Common illnesses include diarrhoea, which kills 1.1 million people annually and is the second most common cause of infant deaths. Many cholera outbreaks are also related to the reuse of poorly treated wastewater. Actions that reduce or remove contamination, therefore, have the potential to save a large number of lives and improve livelihoods. Scientists have been working to find ways to reduce contamination of food using a method called the 'multiple-barrier approach'. This involves analysing the food production process from growing crops to selling them in markets and eating them, then considering where it might be possible to create a barrier against contamination. Barriers include: introducing safer irrigation practices; promoting on-farm wastewater treatment; taking actions that cause pathogens to die off; and effectively washing crops after harvest in markets and restaurants. ^ Walmsly, N., & Pearce, G. (2010). Towards Sustainable Water Resources Management: Bringing the Strategic Approach up-to-date. Irrigation & Drainage Systems, 24(3/4), 191-203. ^ "Extend access to water with the help of technology. [Social Impact]. DESAFIO. Democratization of Water and Sanitation Governance by Means of Socio-Technical Innovation (2013-2015). Framework Programme 7 (FP7)". SIOR, Social Impact Open Repository. ^ Grafton, Q. R., & Hussey, K. (2011). Water Resources . New York: Cambridge University Press. ^ Molden, D. (Ed). Water for food, Water for life is A Comprehensive Assessment of Water Management in Agriculture. Earthscan/IWMI, 2007. ^ The World Bank, 2006 "Reengaging in Agricultural Water Management: Challenges and Options". pp. 4–5. Retrieved 2011-10-30. ^ "GES knowledgebase". Global Economic Symposium. Retrieved 2016-02-16. ^ Howard, K.W.F (2003). Intensive Use of Groundwater:: Challenges and Opportunities. A.A. Balkema Publishers. ^ Mund, Jan-Peter. "Capacities for Megacities coping with water scarcity" (PDF). UN-Water Decade Programme on Capacity Development. Retrieved 2014-02-17. ^ Eggimann, Sven; Mutzner, Lena; Wani, Omar; Mariane Yvonne, Schneider; Spuhler, Dorothee; Beutler, Philipp; Maurer, Max (2017). "The potential of knowing more – a review of data-driven urban water management". Environmental Science & Technology. 51 (5): 2538–2553. doi:10.1021/acs.est.6b04267. PMID 28125222. ^ "Integrated Support System for Efficient Water Usage and Resources Management". issewatus.eu. Retrieved 2017-01-10. ^ Chen, Xiaomin; Yang, Shuang-Hua; Yang, Lili; Chen, Xi (2015-01-01). "A Benchmarking Model for Household Water Consumption Based on Adaptive Logic Networks". Procedia Engineering. Computing and Control for the Water Industry (CCWI2015) Sharing the best practice in water management. 119: 1391–1398. doi:10.1016/j.proeng.2015.08.998.